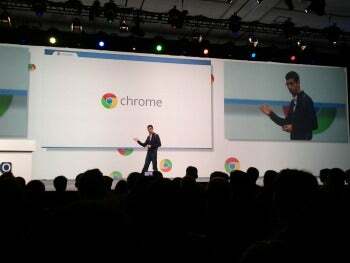 Google engineer Sundar Pichai makes a point during the keynote address that began day 2 of Google I/O in San Francisco. Two Chrome laptops, one made by Asus and one by Samsung, will be sold by Best Buy and Amazon in the US starting June 15. And Google announced inexpensive lease deals that will give businesses laptops and other infrastructure, support and end-of-life hardware replacements for just $28 per user per month. Google's slogan for the Chromebooks is "Chromebook: Nothing but the web." The argument behind it is this: The Chromebook is almost completely an internet device. If you can do your work and access your content on the web, you don't need the virus updates, slow local services, and endless startup process that can plague a conventional PC. Google wants businesses to use the new Chromebooks to quickly and inexpensively update their laptops to run a modern OS. Google says half of all company-owned PCs in America still run Windows XP. To make the Chromebooks fit in better in the office, Google is working on a "Chrome Box", a flat square box that connects Chromebooks to large monitors and company file systems. Google says the OS will stream content from Hulu and Netflix and the new media manager will plug into the new Google Music Beta and Google Movies services. The OS handles photos better now too. Users can now plug in a camera to the Chromebook, move photos from the camera, then store them in the cloud. The day wasn't all about the Chromebook. 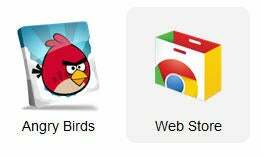 Google announced today several cool new HTML5 tricks for its Chrome browser. Google has been a strong proponent of HTML5, which it says developers can use to develop one version of a Website or service that will have advanced capabilities, and most importantly, work on "all modern browsers."